Kfirim Most Talented Aydah in Camp! We have had quite an amazing week here in Kfirim and we have so much to update you on, our devoted followers! 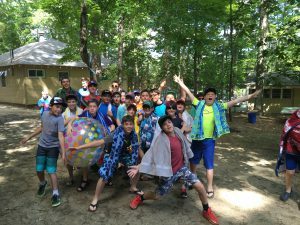 After the fun of Yom Debbie where we danced the night away to the Yavneh Superband and the excitement of Fourth of July celebrations complete with a camp-wide talent show, many of us thought that the week would revert to our normal day-to-day routine, Luckily that was not the case! Tuesday was אחלה יום (trip day) and we had the honor and the privilege of going to WATER COUNTRY!!!! Water Country is a water park near camp which is known for such attractions as the wave pool, the lazy river, Geronimo, and Thunder Canyon. Needless to say it was probably one of the most fun (top five fun) days of our lives. Once we got back to camp we had a BBQ dinner outside before having our aydah talent show. At the talent show we discovered that we are without a doubt the most talented aydah in camp with skills ranging from the performing arts to magic tricks and beyond. On Wednesday we celebrated the birthdays of dear Maya and Yoni (They’re twins!!!) which meant ice cream parties and cake for all! T’was a celebration unmatched the whole machaneh over. In the afternoon we made pita and learned about Israel and played fun sports like basketball. We also learned about טבע (nature) with Amiel!! It was so fun!! We made survival structures! Later that evening we had an educational peulah with our morim (teachers) and all learned about the theme of the summer “Ten Li Yavneh v’chachmehah”. That brings us up to date to today. If you were wondering, we had cheesy eggs for breakfast. They were delish. In addition we are looking forward to our peulot erev (evening activities) that we will be doing with our tzrifim (bunks) tonight. Thank goodness tomorrow is Shabbat because after such a busy week, we are all ready for a little מנוחה (rest)! Check back in on Monday for our next blog post. Until then… yalla bye!